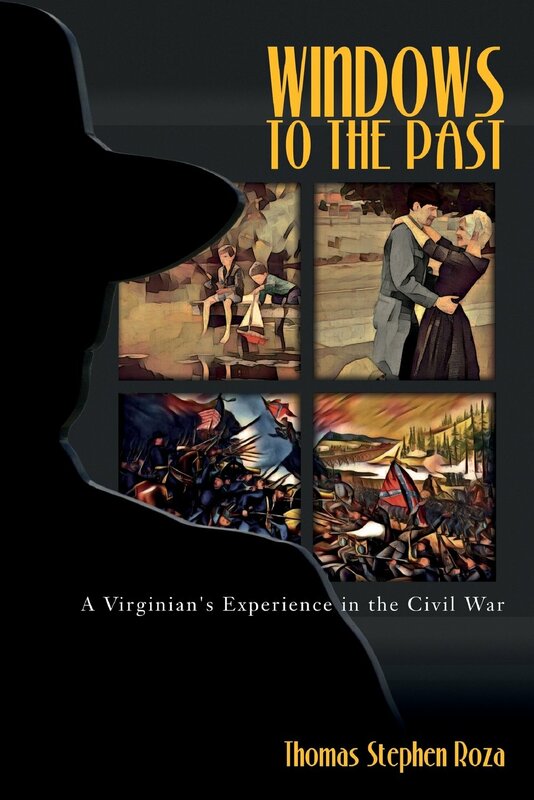 In 2015, the SBCWRT membership approved the acceptance of two very large donations of a wide variety of Civil War media (books, magazines, brochures, newspaper clippings, videos, etc). We then agreed to use the donations as part of a fundraising effort. We formed a subcommittee and developed the concept of having a “Book Faire”. 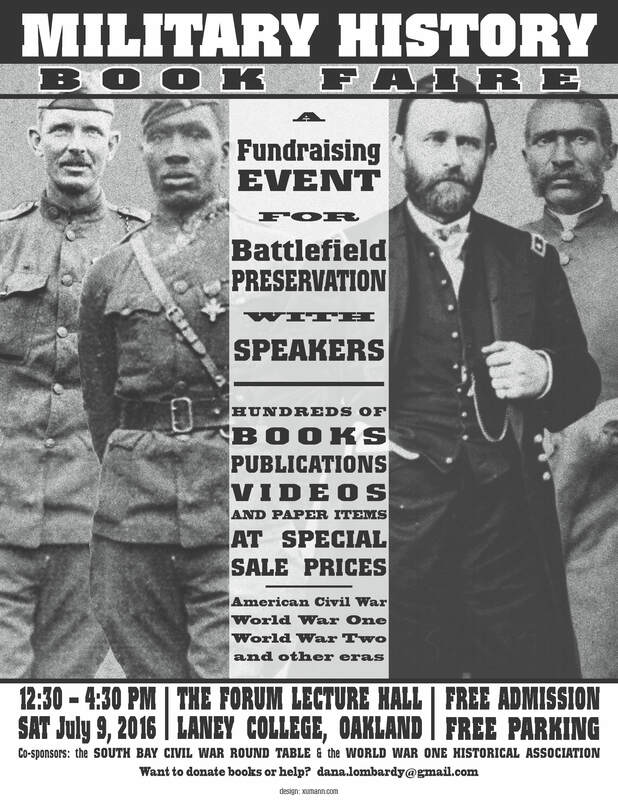 This event will be held in July 2016 at Laney College in Oakland in collaboration with other military historical organizations. This entry was posted in News on May 5, 2016 by hlj. 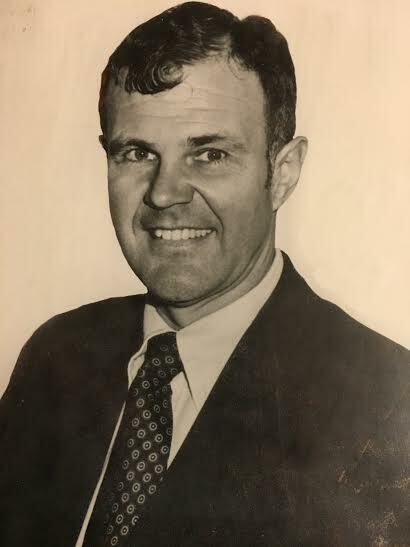 John C. (Jack) Leathers passed away on November 13, 2015, in Davis, CA. Preceded in death by his wife of 51 years, Giske Leathers, survived by daughter Lisa D’Angelo (Philip) of Davis, son John Leathers (Susan) of San Carlos, and Grandchildren Dominic, Benjamin, Christopher, Davin, and Jamie. He will be remembered as a great dad, a loving grandfather, a prolific reader of history books and writer of letters, a dedicated member of the Peninsula Civil War Roundtable, his weekly and exceptional grilling of steaks and “daddy” burgers, and for his LONG, daily walks throughout his life. He was one of the truly “good guys”. Jack Leathers was born on March 3, 1933 (3-3-33!) to Alexander Frank Leathers and Margaret Cochran Leathers in Marion, Indiana. An only child, he grew up in Des Moines, Iowa and Winona, Minnesota, playing golf and football (wearing # 33!) before attending college at the University of Minnesota, the University of Washington, and graduating from the University of California, Berkeley in 1955, where he would earn a degree in Business, row on the crew team, and serve as president of the Sigma Alpha Epsilon fraternity and sports editor of the yearbook. A two-year stint in the Air Force was followed by the start of his career as a stockbroker for Merrill Lynch in Oakland, CA. He began working in Commercial Finance in the early 60’s, working for various banks and lending institutions in San Francisco and Chicago throughout the 70’s and 80’s before closing his career as a San Jose based small business consultant. In 1962 his passion for all things Scandinavian led him to meet and marry Giske Erichsen, the daughter of a Norwegian banker who had recently moved to San Francisco from Oslo, Norway. His daughter, Lisa (Elisabeth), was born in 1963 as they settled in San Jose. Son John Erich was born in 1967, and three years later they settled in Saratoga. A five (5) year stay in Barrington, Illinois was followed by a return to the Bay Area and Saratoga, where they would settle in the Blue Hills neighborhood for the better part of sixteen (16) years before living in Santa Clara, Los Gatos, the Villages in San Jose, and finally Davis, CA to be near daughter Lisa and family. An only child, he valued time by himself, enjoying long (5-10 miles), solitary walks to think and hours reading and writing in his home office. 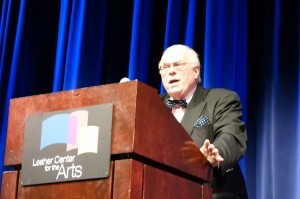 But as a father, he was always accessible, always supportive of our endeavors yet honest in his commentary, generous with his time despite his long commutes from Barrington to Chicago or Saratoga to San Francisco, and always able to tell you that he loved you. Always. A celebration of his life will be held Saturday, December 19, 2015, at 2:00 pm at Saratoga Federated Church at 20390 Park Place in Saratoga with a celebration of life right after (most likely 3 pm) at Los Gatos Lodge, 50 Los Gatos/Saratoga Rd in Los Gatos (near highway 17). There will be hors d’oeuvres and wine and lots of sharing about my dad. My brother and I would be honored to have you all join us. This entry was posted in News on November 1, 2015 by hlj. This entry was posted in News on September 20, 2015 by hlj. 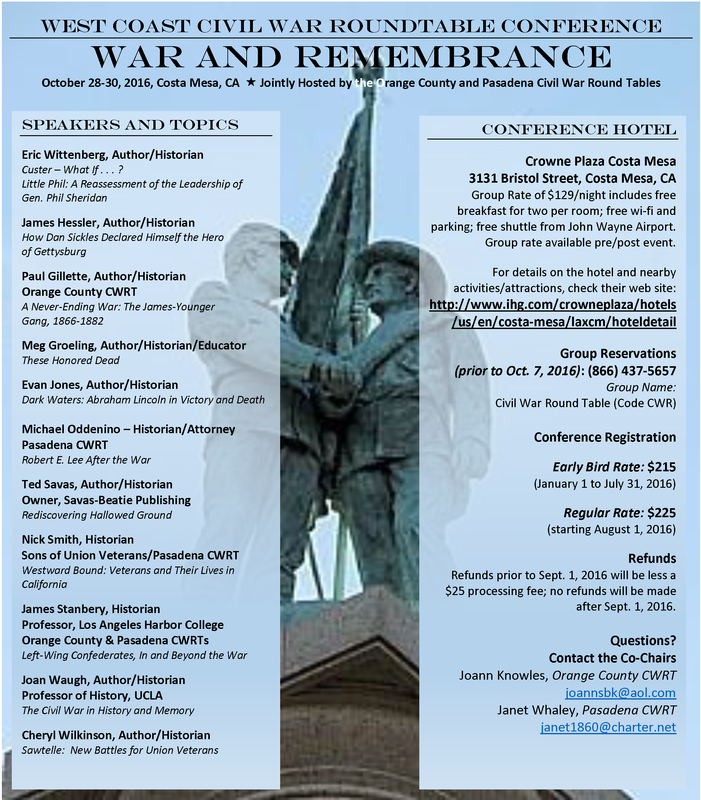 The Sacramento CWRT will host the West Coast Civil War Conference, November 7-9, 2014. 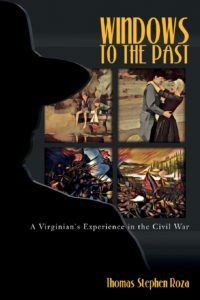 The theme will be “1864” and the fun and learning will start on November 7th (Friday afternoon) with a late afternoon social hour, dinner, and speech. As usual, the activities continue on Saturday with another social hour, dinner, and speech at night. The Conference will continue until Sunday noon when we will all return to our homes. We have the commitments of two very well known Civil War historians to provide much of the action over the weekend. Craig Symonds and Harold Holzer will be doing the heavy lifting. We are evaluating along with them a new format for them at some time over the weekend. This would be a “conversational” format where Craig and Hal would sit in easy chairs in front of the room and carry on a conversation about the events of 1864 – giving their views on issues beyond just relating the facts. What an innovation this could be!!! There will be other speakers and activities as well and a detailed agenda will be released in the near future. Hotel rooms including a hot breakfast buffet will cost $99 for up to two people per room. Stay tuned for more! For questions, email Paul Ruud at , George W. Foxworth at , or Don Hayden at . For reservations, please say Sacramento Civil War Round Table to get the $99 block of rooms. This entry was posted in News on April 2, 2014 by hlj.